The proposed King’s Cross S5 is a mixed-use urban block containing 158 dwellings within the King’s Cross Central Masterplan. Kings Cross is emerging as one of the most joyful, animated and inclusive places in London that requires an equally joyful building. With its unique position in the masterplan, S5 is a landmark structure that will reinforce King’s Cross unique sense of place and celebrate its emerging and historic contexts. In response to its prominent siting in the cultural quarter of King’s Cross in London, our concept’s central architectural and urban gesture is its arcaded base and top – a welcoming gesture to draw people towards it. The arches of Kings Cross & St Pancras stations are reinterpreted in a contemporary ‘Bézier’ curve form, so that the building appears to sit lightly upon its urban landscape. The scheme is conceived as a six-sided perimeter block with no back, arranged around an internal courtyard from which taller forms emerge, ranging from four to fifteen storeys. This ‘unfolding’ urban block intends to convey a sense of inclusiveness in all directions. 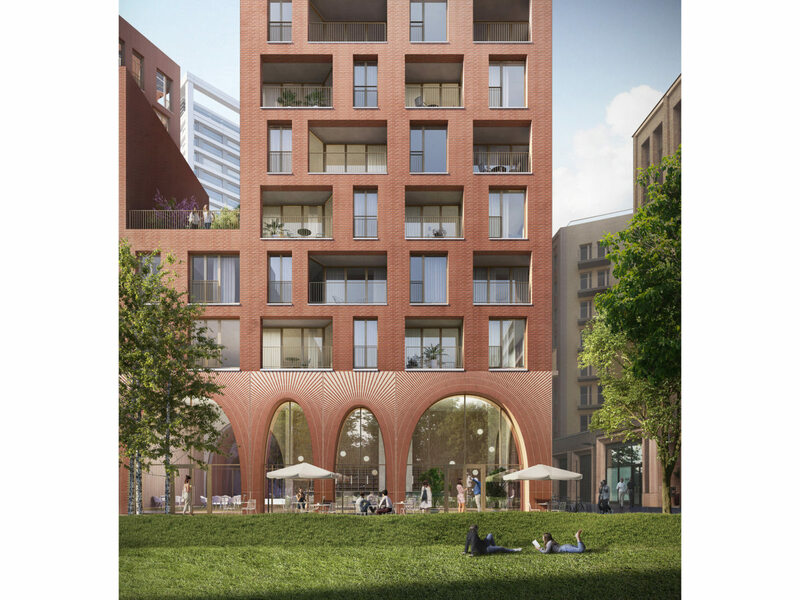 Conceptualised as a linear block of varying heights that wrap around its site, the scheme has been tailored in its massing to response to its Park frontage, to create a frame for adjacent public spaces such as the approach from York Way, Chiltern Square, and to its neighbouring buildings. Arches are carefully placed at key locations around the building, in a kind of 3D picturesque sequence of moments. Like follies in a landscape garden, each has a unique role defined by its setting. These arches form a series of recognisable destinations when approached from afar, and when reached, they each become a frame for the next. The building slowly unfurls and reveals itself through this series of vignettes, first caught in glimpses and then experienced spatially and materially. At street level, the scheme’s double height arcade leads to a central courtyard where a reflecting pool mirrors its enveloping arches, staircases and hanging gardens. 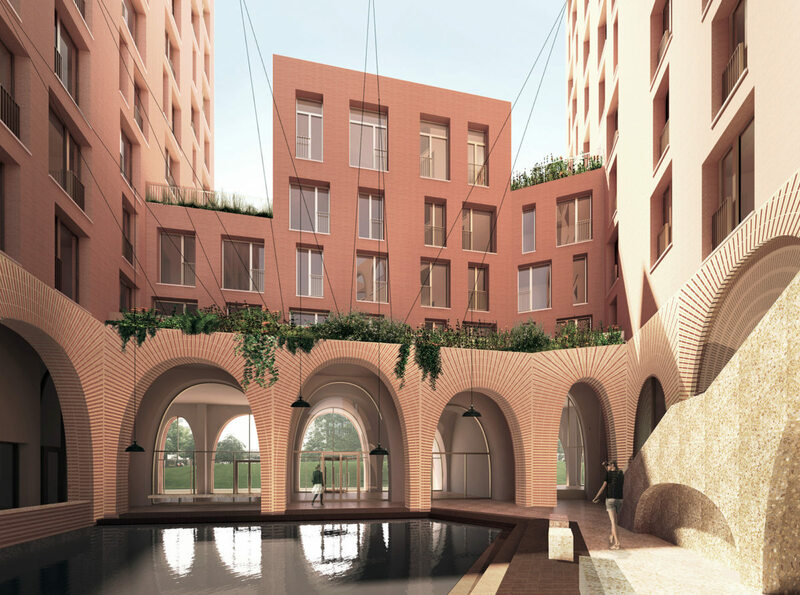 Alison Brooks Architects have collaborated with Landscape Architect Todd Longstaffe-Gowan to evoke not only the tectonic qualities of King’s Cross, but also the atmosphere of Roman cisterns and Venetian fondamenta. Around the reflecting pool, restaurants and bars will benefit from sun shading and shelter of the arches. The scheme’s two towers house the Market Sale and Intermediate units by Pocket Living. Recessed balconies allow residents to enjoy views across London sheltered from wind and rain, animating the façades with shade and shadow. The scheme was granted planning permission in December 2018.